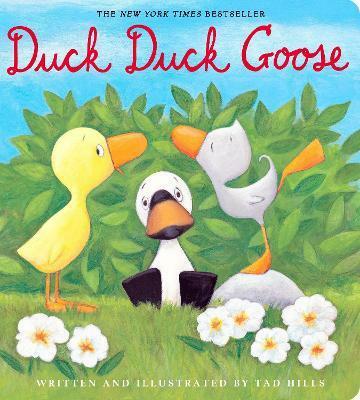 The beloved, classic, and New York Times-bestselling odd couple Duck & Goose are back, and this time their friendship is put to the test! Duck & Goose, Goose & Duck. Feathered friends forever . . . or are they? You see, there's a challenge to their friendship: a little whippersnapper of a duck named Thistle. Thistle is good at everything (or so she thinks), from math to holding her breath to standing on her head. Duck thinks she's fantastic. But Goose does not! And so Goose is faced with a problem close to the hearts of children everywhere: What happens when your best friend makes a new friend? Tad Hills is the author and illustrator of the highly acclaimed New York Times-bestselling picture books Duck & Goose; Duck, Duck, Goose; Duck & Goose Go to the Beach; How Rocket Learned to Read; and Rocket Writes a Story. He has created numerous Duck & Goose board books, among them the ALA-ALSC Notable Children's Book What's Up, Duck? ; Duck & Goose, It's Time for Christmas! ; Duck & Goose Colors! ; and most recently, Duck & Goose, Let's Dance! The Rocket series includes a board book, Rocket's Mighty Words, and two leveled readers, Drop It, Rocket! and Rocket's 100th Day of School. Tad lives in Brooklyn with his wife, their two children, and a dog named Rocket. Visit the author online at tadhills.com.